With our inkjet and cutting technology, we will support the production of images rich in creative design in 3 fields. Innovative, creative applications drive the evolution of our sign graphics products. The worldwide standard for “Speed” and “Brilliance” in inkjet imaging is our goal. In our main market, i.e. the signage and graphics market, our company fulfills market requirements and leads the industry in supplying creative products. Also more affordable machines for the developing countries and new ink developments will enable us to expand our global operations. Emerging new applications for industrial inkjet printing. Digital on-demand industrial production with enhanced inkjet technology. 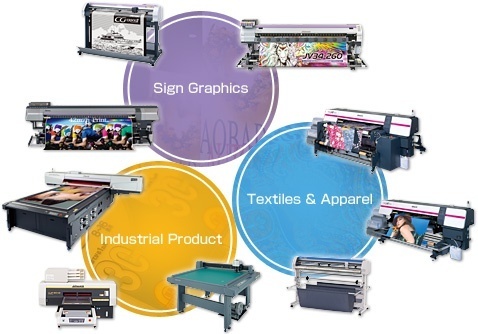 For the high growth potential industrial markets we have developed both a high resolution UV-curable inkjet printer for small batch on demand production, and complementary large-sized cutting plotters. Digital creative power that stimulates the fashion industry has generated firm trust in digital printing from the European fashion industry. Our pioneering work in the textile and apparel markets will continue with the development of new products to increase productivity and image brilliance. We also provide a total solution including pre-treatments and post-treatments to bring on-demand printing closer to the consumer. Through these activities, we will propose new low-cost manufacturing harmonized with environmental concerns, where all necessary resources and energies will be used only at the time and in the amount they are needed. And we strive to become a development focused global corporation known for our own brand worldwide.